Sciblogs | How does photography change our experience of life? In this episode I talk with Assistant Professor Alixandra Barasch, based in the Stern Business School, New York University, USA about taking photographs. For many of you listening to this podcast, taking photos of things and people in our lives has become much more common. Understanding how the act of taking photos may get in the way of, or alternatively, increase our pleasure in these activities seems like an important topic for research. Implicitly, we may hear the message that we should stop taking so many photos and just be in the moment and enjoy our experiences without trying to record everything. Sometimes, we actually hear this from people who say it out loud. But is this true? Does photography – especially using our smartphones – get in the way? 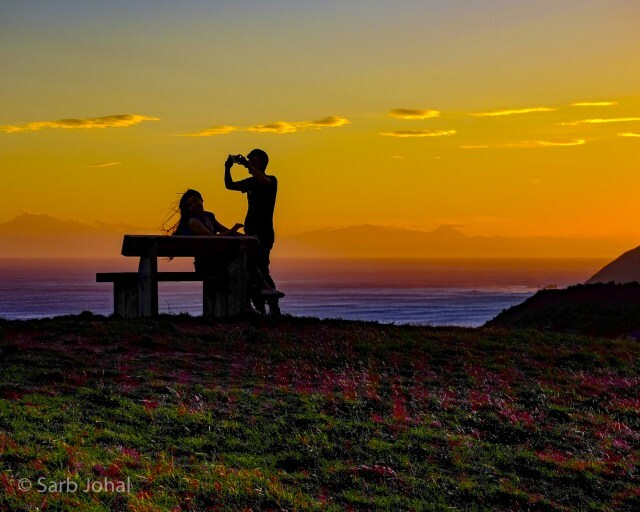 Sarb Johal : Now the number of photos that we’re taking on a daily basis, either through our smartphones or cameras, which are very cheap and easy to buy, and very easy to use, has increased immeasurably over the last few years. We seem to be taking photos of our food, when we’re at parties, just walking down the street. Just all the time. Many researchers have been wondering how this is impacting upon our psychological experience of living our lives. When we are constantly taking out cameras to capture moments, how is this interfering with our experience of the world or our relationships, or how we picture ourselves and present ourselves to the world, and the way that we share these photos through social media or other channels. Alix Barasch: I started thinking about these research ideas when I was living abroad, before I even started my PhD. I traveled a good amount and did a Fulbright scholarship in Asia. During my year there in Hong Kong and Macau, and going all over Asia, I took a lot of photos, probably as you might expect. Thousands of photos. I started to realize that the photo taking that I was doing was affecting my experience, and that was both for better and for worse. There were times when photo taking was really enhancing my experience and making me notice things I might not otherwise have seen, and helping me take in my surroundings, and then there were other times where I was getting very stressed out by taking photos, and there were anxieties that came with thinking about all the photos that I would want to post and share with people.Going into grad school, I realized that I wanted to study that systematically, I started my PhD with these questions in mind, and decided I wanted to experimentally investigate how does photo taking affect consumers and people’s experiences more broadly, both the enjoyment and their memories of the experience. SJ: That’s interesting. You’ve touched upon lots of different things there. Some of the things that I noticed were that the number of photos that we take these days, and that you noticed, even before you started your course of study there on this topic. The other thing, one was an internal experience of interruption. This idea that actually taking photos interrupted somehow, your experience of engaging with whatever it is that you were taking a photo of. Then, I noticed, you were talking about the anxieties around the sharing. Around well how do I and who do I share this image, and by default, the experience with, and how you go about doing that right? SJ: There’s quite a few different things that you’ve touched upon there. In this paper, it’s a really interesting paper I’ve found, because you’ve got a series of nine studies reported in this one paper, and in the setup of the paper, you talk about your goals specifically is to understand whether the enjoyment of the experience itself is affected by whether or not people take photos. But there’s a few theories underlying why that might be, and I was wondering if you could walk us through some of that. AB: Yeah, absolutely. We came at this from, again, a little bit like my own experience, from the angle of we are researchers and we don’t know which way it’s going to go, and so we were open to seeing empirically, where the data would take us. But then theoretically, there was definitely research that could also, like my intuitions and on experience, could support both directions. It’s mostly focused around your point about interruption, but how that can actually go in the other way as well, so we used the term engagement in the paper. That’s really, if you think about the psychological theory behind it, it’s really more like an attention point. When I’m taking photos, it’s possible that they will interrupt my experience, that they will cause me to be less engaged with the actual event or the experience itself, that I’ll be thinking about the photos themselves instead of the experience, and I think a lot of people have that intuition, that photos are ruining our lives because we’re so focused on that instead of living. But the other side of the equation, and as you know, what we ended up showing across many studies, is that photo taking also can shift your attention in a way that is actually more immersive and engaging with the experience. When I am deciding what photos to capture, I’m searching the visual field, I’m taking in content that I might not otherwise notice. The decision itself is very engaging, and the psychological theory of attention and engagement, and being in a flow state like that, it’s just the more that you’re doing those things during an experience, it’s actually going to get you more involved, to get you to actually enjoy that experience more, when it’s a positive experience. We saw how this same theory could make predictions in both ways, and then we went in, I’d say, a little agnostic, and said, “Let’s see what the data says.” We’ve shown across dozens of studies, not just the ones reported there, that while, for sure, it definitely takes people out of experiences sometimes, and we have studies in the paper showing the boundaries of this, that’s, for sure, true, but for the most part, the modal and most common responses at photo taking actually enhances enjoyment of people’s experiences. SJ: I was very curious and examined my own experience when I was reading your paper, because I’ve been taking photos for a lot of my life. What I notice is, is that even pre smartphone photos, and just the fact that this is just so available now, when I would use a camera to take photos of things, often I would, even for days afterwards, be looking at things in a particular way. I’d be looking to almost trying to compose a shot, so the way that I engaged with my environment changed quite a lot as a result of that. SJ: I’d always be, as you say, a little bit agnostic around I don’t know whether that’s good or bad. Whether I’m looking at it in this way or not. Maybe it’s making me appreciate it in a different way perhaps, than otherwise I would have done if I hadn’t been in photo mode. AB: Right. I love that point. Your experience is consistent with some of the data we have in the paper, which shows that we can even get people to take mental photos. That it doesn’t have anything to do with the physical act of pushing a button or taking the photo, that it really about the attentional process. This mental thing that we’re doing, that we’re engaging with the world different. I also really like your point that it’s not necessarily good or bad, because we have another paper that looks at the memory process from photo taking, and there we show that, as you might expect from focusing on visual details, that photo taking can actually enhance our memory for visual content. But because it’s diverting energy and resources to visual, it takes away from our auditory capacity, and so we’re less likely to remember auditory aspects of our experiences. Maybe that’s the person that you’re talking to during your experience, or maybe it’s the tour guide telling you about your experience. It’s really a good point that you made, that we try to stay away from good or bad about photos, but we just have to realize that this mental process is reshaping the way we live our lives, the way we approach our experiences, the way we see things and hear things, and so that’s pretty important. I like your perspective on that. SJ: As you’re talking Alix, I’m sat there thinking I wonder how short videos also map on to this? Because you’re talking about this multi-modality, and perhaps when we’re taking photos, we’re probably more dominated by that visual attention, and perhaps we’re not paying as much attention to other things that are going on, so we don’t have the chance encode it in memory because we’re not rehearsing it and we’re not looking at it and attending to it. If we’re not paying attention to it, it doesn’t go in right? SJ: We don’t have the chance to remember it. SJ: I wonder about videos. I wonder about those Instagram short videos, and maybe how does that work in terms of memory? Are you aware of anything around that? AB: No work that I know of that has studied that specifically. I would say based on our theory that we can make very clear predictions about how a video might operate, and to your point, when there’s additional modalities, sensory modalities, then your attention will have to divide between them. My favorite example of that is just thinking about at a concert, the goal is oftentimes to hear the music and not to just see the singer or band, and so you can imagine a video has both components, but you could also imagine recording, and recording would really shift your attentional resources to just the music. Photos are going to shift your attention to the set and the lights and the visual aspects. Video is unique because it has both aspects, but for sure, that’s going to change your attention, and will probably come somewhere in between those other two modalities that we’re capturing when we do it alone. That’s really cool, and we show in another paper, that it’s really about the salience of one goal versus the other. If I can really make the visual very salient, then that dominates, if I make auditory salient, that’s going to dominate, and probably video’s going to come somewhere in the middle. SJ: That salience …. before we get into the studies, I was also interested your introduction, when you were talking about this, I guess it relates to this idea of multi-screening. People watching TV, but also perhaps posting on Twitter or on Facebook, on the actual site of that show that they’re watching, and engaging with content or with people, or with chat at the same time. SJ: I guess the purpose of that is to try to increase engagement with what’s going on, but then you’re also dividing attention across these two different ways of engaging with the show. I guess that’s an increasingly modern phenomena. We’re seeing people multi-screening all the time now. AB: Yeah, totally. It’s a good question. Something that multiple researchers are working on right now. There’s no paper out yet, but the interesting aspect of multi-screening that you brought up, that is multitasking and doing multiple things at once, that is definitely part of it, and it could be engaging to the extent that you’re doing things that are related, but it could also be very distracting if you’re trying to do too many different things. The other piece is that oftentimes, multi-screens come with social media and getting feedback on the content that you’re viewing. Imagine going watching a TV show or going through an experience where you’re texting about it or sharing about it, or in a chatroom about it, or reading what people are saying on Twitter about it, so there you actually get this extra force of social connection, which as lots of psychology has shown, is a very good thing. It could be that the multitasking is detracting from it, but that the social connection really enhances that, so those are going to be some interesting forces that have to get teased apart in this new research. SJ: I think that’s an interesting point, but because I guess that that social connection assumes that the social connection is good. SJ: Often we find that actually, you can get some really challenging and nasty stuff going on on social media too, which then changes the emotional tone of your experience, which means that you may encode it and associate it in memory, in different ways. AB: Yeah. That’s a really good point. In this work, the who is the audience, who are the people that you’re talking about really matters. When you’re talking with group members, or perhaps these are people who are more or less similar to you, that can really shift the conversation. You can imagine political views are something that people feel very strongly about, at least here, and so there in the anonymous world of the internet, it can definitely detract as well. It’ll be highly dependent on all of those things. SJ: Yes. We’re on a different show now, so let’s get back to your study. SJ: Your first four studies, you were looking at trying to examine the basic effect of photo taking on engagement and enjoyment. You had some lab studies here, and some field studies. Maybe you can just walk us through what you did and what you concluded from those first four studies. AB: Yeah, sure. One of our favourite studies is the first study in the paper. That is because we actually hired a bus tour in Philadelphia, to take students and other people who were part of the study, on a real-life bus tour of Philadelphia, where we hired a tour guide. The tour guide had a script and said everything exactly the same across conditions. We randomly assigned people on this bus tour, every other hour, to switch whether they could take photos during the bus tour or not, and we didn’t make it so that we were taking photos away from the controlled condition, we just said, “Okay, leave your belongings here with us, because it’s a study.” Then other people we said, “Bring your…” Well actually, we gave them cameras so everybody would have one, and so, “Bring your camera and take photos.” We just had them do a route around Philly, it took about an hour, and they came back and they filled out a survey. The survey asked them about their enjoyment of the experience, how engaged they were, as well as a few other items around their likelihood to recommend the experience to others and how much they felt like they learned. All of these things go together, where we find that those who were allowed or able to take photos during the experience, they enjoyed the experience more. That this was driven by the increased engagement or immersion with the bus tour. They also felt like they learned more and were more likely to recommend it. But really what we care about is the enjoyment process, and then we build on that in all of the remaining studies. We did something very similar at Reading Terminal Market, which is basically just like this farmer’s market in Philadelphia. Everybody has intuitions about what is all this photo taking doing to our meals, and everyone has to take a photo before they eat anything, so okay, let’s look at an eating experience. We went to this farmer’s market, and we just approached people at the table, the tables where they eating. Again, we randomly assigned people to one of two groups. In the group that was the control condition, we didn’t tell them anything. We just said, “Enjoy your experience as you normally would, and fill out the survey after you’re done eating.” In the other condition, we asked them to just take three photos of their food, and then again, “Eat as you normally would, and then answer the survey.” There we also find a similar effect, where those who took photos of their actually report that they enjoyed the experience more. AB: Building on that, and you mentioned the lab studies, we’ve then moved to a lot of studies that are using our virtual reality paradigm, where we have people in the lab, going through a virtual experience from a first person perspective. They watch a video, but it’s as if they’re there, so on top of a tour bus, or maybe they’re scuba diving or they’re watching a concert. We have a number of different experiences, also safaris. Then they go through that experience, and our interface allows people to take photos, so that gives us a lot of control over the experience. Everybody sees the exact same experience, but we randomly assign people, either to take photos or to not be able to take photos, just watch the video. Those who were able to take photos, again, they report that they enjoy the experience more. We measure immersion or engagement, and so that is consistent evidence with the field data, but here, we get just even greater control because we’re able to say, “Look, these two experiences were identical, but those who could take photos enjoyed it more.” We get some evidence of the engagement process in another way, because you might be thinking well this is all self-report, and people say different things when they’re just reporting from their mind, but I really love the study where we go to the museum and we actually have eye tracking data. We have people wear these goggles that track where their eyes are, and we find this evidence for our engagement process, through people’s eye movements, they’re more attentive to the artifacts in the museum, instead of other distractors, their surroundings, the floor, the ceiling, the other people. When you’re going through an experience with a camera, or like I said, even just mentally thinking about what you want to capture, it actually changes what you look at, and that engagement process, that visual attention is what’s driving this greater enjoyment that we find consistently from self-reports. It’s a really nice additional study that demonstrates the mechanism of engagement or visual attention through physiological measure, which is people’s fixations. What are they really fixating on and attending to in an experience? SJ: I really like that part of the paper, where you have this objective indicator, where you’re actually using eye tracking equipment to check where people are actually looking. I think that that really added something to the paper. But you also made me laugh around the whole Instagram experience of people taking photos of their food beforehand. When I saw that study I thought yeah, this is what people do. This is really interesting. SJ: Your last set of studies, you were really looking at the role of engagement. How that act of photo taking may interfere, or perhaps reduce the amount of enjoyment that people may have. What did you find there, and how did you go about looking at that? AB: Yeah, exactly. I totally see the paper the same way as you. I start off with this demonstration that photos can really enhance enjoyment, and then the last three studies look at the boundaries. That’s, like you pointed out, in the effort of showing this engagement piece. You can build on our theory and say, “Okay. Well if it’s about engagement, then if you have a photo taking experience that is not engaging, then you shouldn’t get the same effects.” We have what we call our bulky interface study, where you can imagine our phones are just super easy now to just snap photos, but there’s other types of cameras that are less easy to use, that they really put more of a barrier between you and the experience. In that way, if it’s about engagement and that’s creating a barrier, then we wouldn’t expect the same effects there. We manipulate that in our study, and show that the positive effect of photo taking is diminished or even disappears, the more distracting the photo interface is. If it’s bulky or it causes, like I said, a barrier between you and the experience, then that really takes away from the ability of photos to enhance your enjoyment. That really speaks to the engagement process. We also look at when you are engaged in an experience already, so you can imagine that the photo taking engages you, and that’s a really insightful finding for anybody who’s been to something really boring before, and thinking about how photo taking can draw you in and enhance. That’s cool, but what if you’re already engaged or involved in the experience? That’s where we have this craft study where people are either observing a craft person making something, or they’re doing the craft themselves. If you’re doing the craft yourself, you’re already engaged, and photo taking in that case, does not enhance enjoyment. It might even detract in some situations. SJ: That’s interesting to me Alix. I guess as a clinical psychologist, I was really interested in that last study. I guess because we have a whole bunch of citizen reporters out there now, with smart phones that are capable of recording things that we just couldn’t even think about even five, 10 years ago, by the sheer ubiquity of these devices, we’re going to be capturing and attending to these terrible events that are going on in our communities, that go on every day, road traffic accidents, whatever it is that we’re thinking about. We’re going to be looking at them and attending to them in ways that we perhaps wouldn’t have done beforehand, and I wonder about what the impacts of that might be for those people experiencing that, but also for those people who then are also sharing in that experience, through distribution on social media and other platforms. AB: Yeah, that’s a great question. I thought about it the other day, walking down the street of New York. There’s a bunch of fire trucks and you see everyone craning their necks to try to figure out what’s going on. People want to document and capture things, partly to prove that it happened. If there’s no photo, then it didn’t happen, I think is a lot of people’s perspective. Yeah, I think your point is a good one, that to the extent that our world isn’t all positive, to even all neutral all the time, that if we’re attending more to visual details that aren’t positive or are nice looking, that that could be harmful. Then to your point about the sharing part, I totally agree that there’s a downside that also comes from being always thinking about how your photos are going to look to others. Another paper that we have on this, really looks at that part of the process, and how attending to the self-presentational part, and how is this photo going to look to others? What I mentioned earlier from my abroad experience, that some of throughout negative came from thinking about the anxiety of how is this going to look to others? That is something that can really detract from, again, the positive effects of photo taking can be diminished, or perhaps even go the other way, where you find negative effects from photo taking because you’re thinking about the other things. The aspects that are not about the experience. About capturing something in a way that will present yourself in a particular light. SJ: Absolutely. That’s what I was thinking about, because actually, taking photos, but then sharing them as well are acts of construction of self. It’s not about the enjoyment of the experience that you’re going through, but it’s also a representation and processing, and perhaps a reflection of who am I as a person? What is it that I’m interested in? And sharing with other people. AB: Yeah, interesting. We call it the curation process, and a lot of people already know that we spend a lot of time curating our presence on social media. A lot of other researchers have studied that, and I think that our photo taking paper really just suggests that that process can be even stronger when you’re capturing photos, because photos are less easy to alter. I can just tell you about my really great experience, and I can exaggerate and it’s easy to talk, but when we’re taking photos, it becomes more concrete and it becomes harder to alter, and so we get really obsessed with getting the perfect shot. That could be harmful I think, for us, moving forward. SJ: There’s a couple of open questions that you have. I just want to pick up on a couple. One you’ve written about in your paper, and that’s the number of photos taken. SJ: I guess that that, for me, is also around the time proportion taken in terms of taking photos when you’re actually doing something, engaging in an experience. What were your thoughts around that? How do you think that that might influence things? AB: Yeah, it makes sense. We all, all of my co-authors and I, we’ve always been wanting to show a boundary of number of photos taken. That when you take more photos, you spend more time on it, that that’s, at some point, it’s got to get in the way when we’re taking thousands of photos on our vacations. We have tried very hard to show that in the lab. We haven’t really found a boundary, at least in our laboratory studies. These are short experiences though, so really, we’re not able to go yet, into somebody’s spring break experience, where they go for a week and come back with 100,000 photos. I think there probably is a boundary there, it’s just that with our methods, where they are right now, we haven’t really been able to document it. But if you think about engagement and all of the things we’ve already talked about here, then it would make sense that at some point, photo taking is going to detract. Just we haven’t been able to show it, and it’s just a very powerful effect that photos, even if you take 100, it’s really good for people. It draws them in, so maybe just keep doing what you’re doing. SJ: The other question that I had going through my mind, I’d be interested in your thoughts on it, is how much do you think this is a generational cohort effect? Does a previous history of taking many photos whilst you’re going through an experience, map onto your findings? Perhaps it might be that those people who are maybe 50 or 60, who haven’t experienced the last 10 years of really taking a lot of photos, and perhaps didn’t take so many photos in the past, how does that map onto this? AB: Yeah, that’s a good question. We’re definitely interested in the age aspect, and cohorts and generations. Okay, there’s two different aspects of that. One is what are people’s intuitions? We find that definitely people in older generations have a stronger intuition against the positives of photo taking. That they think photo taking is harmful. In our studies, and in the paper we’ve been mostly focusing on here, we have not found differences in age. That even for older people who have these stronger beliefs against photo taking, that they get a lot of these benefits, it makes them more engaged, and oftentimes enjoy there experience more. Where we do find differences on age is with the sharing process. For older people, it’s not the case that sharing photos comes with the same level of curation that we now have with social media and Instagram, that sharing for older people tends to mean more with family and friends, and people who are less likely to be judging us, or they’re not thinking about all of the likes and the comments, and all of the things that younger generations are. We do have a study actually, that looks at age explicitly, and shows that the negative effects of taking photos to share, is reduced or diminished completely, or is completely gone for older people. They don’t get stressed about sharing, and that’s probably because for them, sharing is different. But where we see the effects most strongly are for those millennials who are really used to getting that perfect shot, curating their life on social media. That’s something that when I talk about my findings, my students and everybody can really relate to, because it’s just something that is part of their world, and that’s the piece that I find to be more strongly correlated with age. It’s not the photo taking itself, but the sharing process that really matters for age. SJ: Sure. Alix, apart from tech companies who are going to bending over backwards to remove barriers for people taking photos, and to increase the sharing capability of them, who should care about this research? What’s the point? Why should we be paying attention to this? AB: Right, yeah. Definitely being in a marketing department, I oftentimes have to talk about the companies and why they should care, but I actually prefer the other side of the question that you’re asking. I think it’s really about consumers and consumer welfare, and just people more generally. I think that just thinking about the way that we all live our lives, that these findings are really informative. That it’s not, again, back to our earlier discussion, it’s not about what’s good or bad, or should I take photos or not? It’s more what are my goals in this particular experience, and how should that drive my decision to take photos or not? Let’s say I’m in a foreign country and I’m not able to speak the language, so I’m not already engaged in something, or a conversation, I’m just observing, I want to take in my surroundings, then photo taking can really be beneficial for you as a consumer, as an individual. If you’re at a concert or at a restaurant where you don’t necessarily care what the stage looks like or what the food looks like, but you really want to hear the music or taste the food, then you might want to put your phone away because we know that by focusing on the visual details from the photo taking action, then you’re less likely to remember or attend to these other details that might be more important for the experience. Of course, it matters whether you’re taking photos for yourself to remember forever, or to share. What I always recommend for those who do care about posting on Instagram, that to the extent that you can really try to activate that goal after the experience is over, when you already have the photos and you’re choosing which photo to post, then that can actually lead to less anxiety during the experience. You can really, as an individual, change the way that you enjoy thing, by trying to just immerse yourself, take the photos without taking 70,000,000 of them to get the best shot in the moment. Take a few. Your photo’s probably going to be fine for social media. Choose that later, activate the goal later, and we find that when you activate the goal after the experience, it doesn’t retroactively change what you remember or how much you enjoy it. It’s nice if you can just live your life in the moment, take photos for your personal memories, and then later on, activate the sharing goal. SJ: As you’re talking, you’re very much reminding me of something I scrawled on the paper, is how is this linked to the concept of mindfulness? 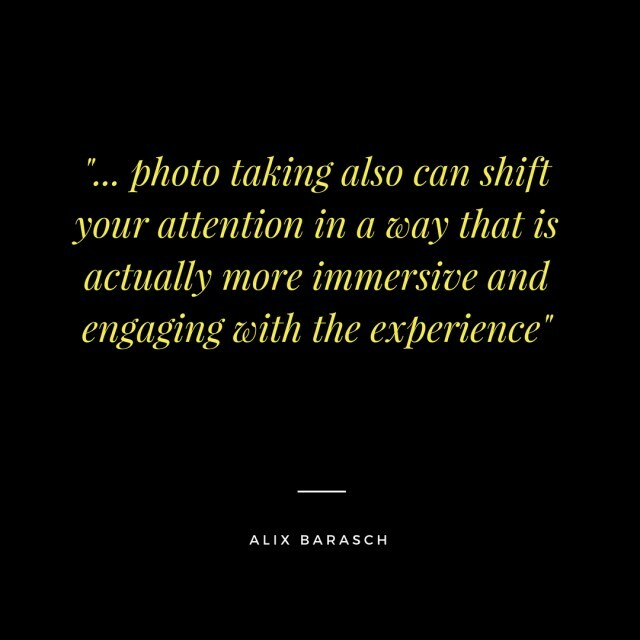 Because you’re talking a lot about this idea of multi-sensory immersion in an experience, and how photos can perhaps take away from that. You have a very visual experience, but as you say, understanding what your goal is around the taking the photo. It’s much more around how you take the photos, rather than the activity of taking the photo itself right? AB: Yeah, exactly. It speaks back to that mental photo study, where it’s really not about the act at all. It’s about just how you’re engaging with your environment. I can push a button, and that’s not changing my enjoyment, but it’s about what I’m attending to, what I’m processing, what are my goals? What are my higher level goals for doing this action? That’s the psychology behind it. It’s not a physical effect, it’s a psychological effect. The post How does photography change our experience of life? appeared first on Sarb Johal.